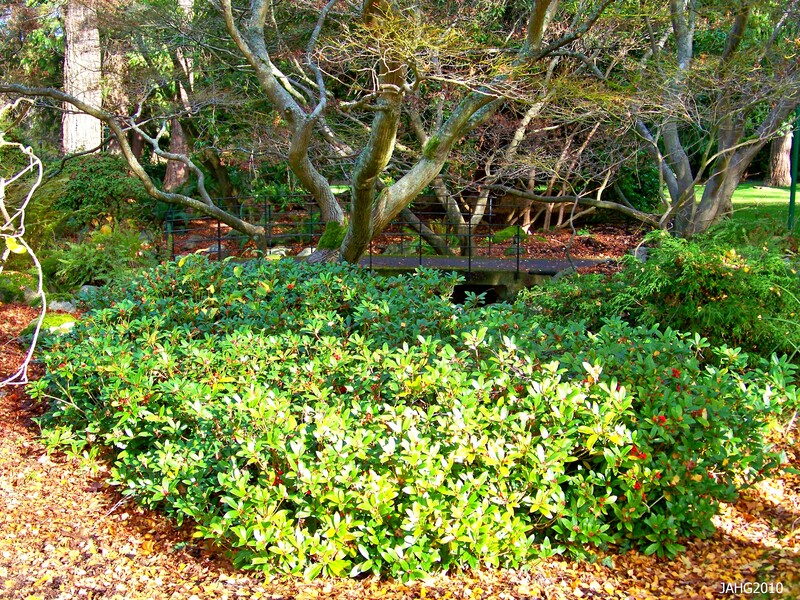 At this time of the year I really become aware to the color of foliage in various plant in the landscape. Plants are still fairly fresh and their foliage is alive and vibrant with color. Colors other than greens stand out in ways that often fade as the season goes on. It is unusual to find a group of plants with more color than those of the Cotinus (Smoke Bush) family which gives a show from spring until late autumn.Their color ranges from black purples, wine reds, bluish green, green and into chartreuse yellow – and this does not include autumn tones which are just as show stopping! The color tones in one branch of Cotinus coggygria 'Velvet Cloak' is remarkable. The genus Cotinus is a member of the family Anancardiaceae which also contains the Mango, Cashew, Poison Ivy (Sumac) species and was at first classified as Sumac(Rhus) species until it was separated from the other members. 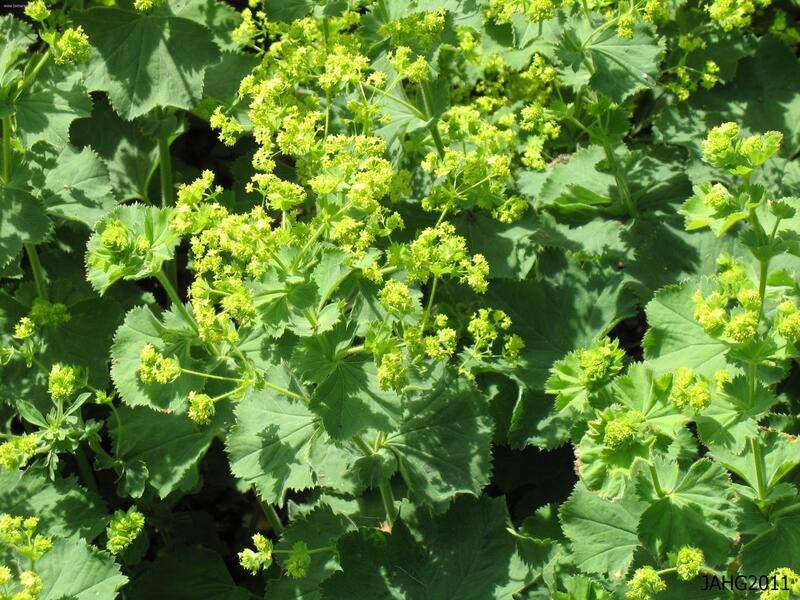 It does not irritate the skin or have sap which can burn. 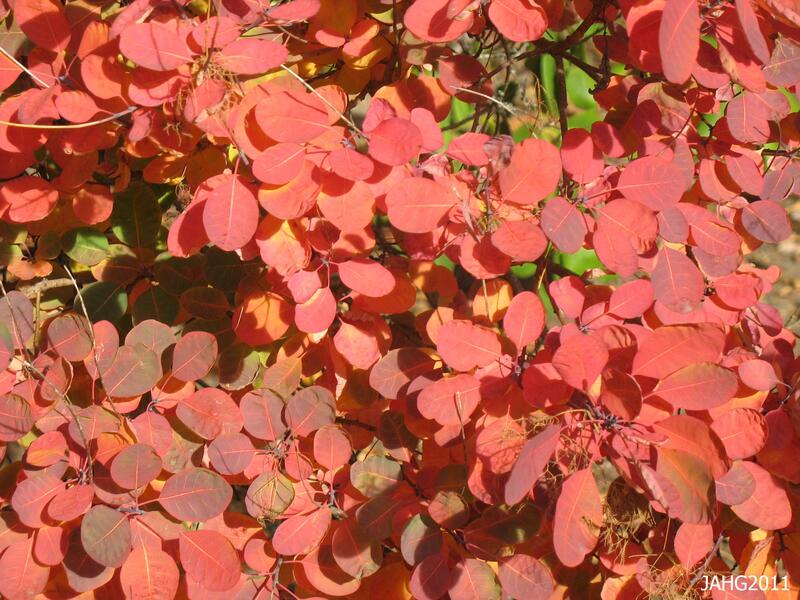 Smoke Bush(Cotinus) generally have brilliant autumn colors ranging from scarlet into to peach and golds. Cotinus is a small genus of 2 or possibly 4 species of which coggygria and obovatus are the best known. Cotinus coggygria is the species which is best known in the landscape and originates in Europe from France into Eurasia and possibly all the way into China. The far eastern representative coggygria sometimes listed as another species C. szechuanensis (var. szechuanensis). The other well known species is C. obovatus and comes from North America particularly in Tennessee, north Alabama, Missouri, Arkansas and isolated pockets in central Texas. All Cotinus species have been used extensively for a source of dye wood as it gives colors of orange-yellow and yellow coloring. The use of C. obovatus as a yellow dye source before the civil war in U.S.A. almost brought the species to extinction in its native habitats. Cotinus 'Grace' is a cross between Cotinus coggygria 'Velvet Cloak' and C. obovatus. Cotinus is from ‘Greek’ kotinos meaning wild olive but why it is named this is unknown. 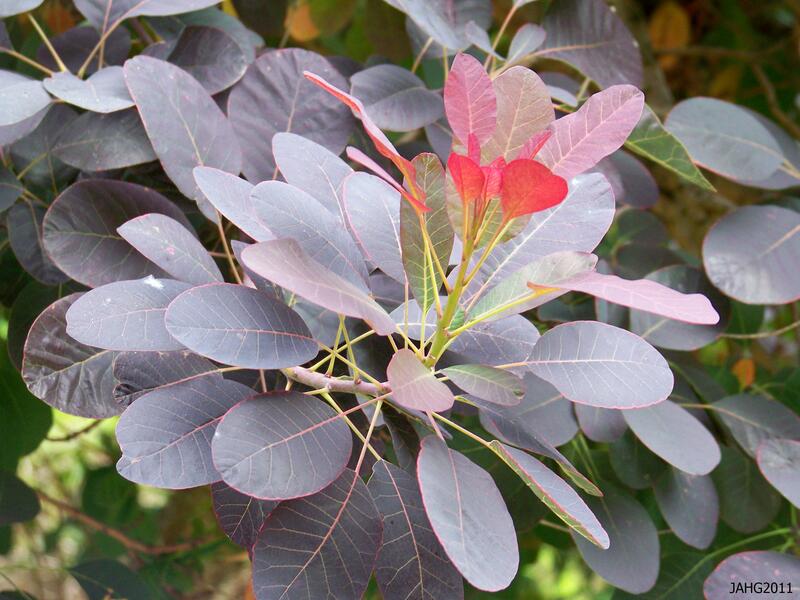 Coggygria also comes from ‘Greek’ kokkugia- the name of ‘Smoke Tree’. 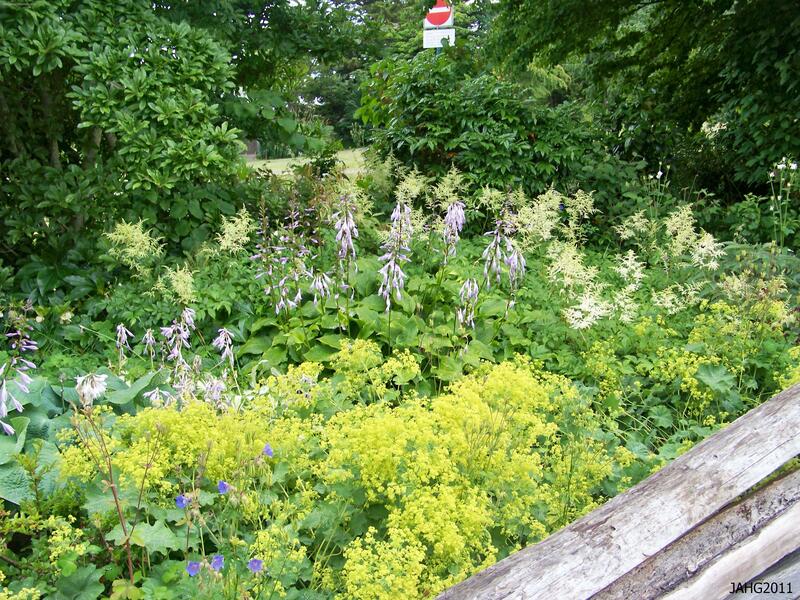 C.Coggygria has been cultivated in gardens for an unknown period but is first mentioned in the mid 17th century. 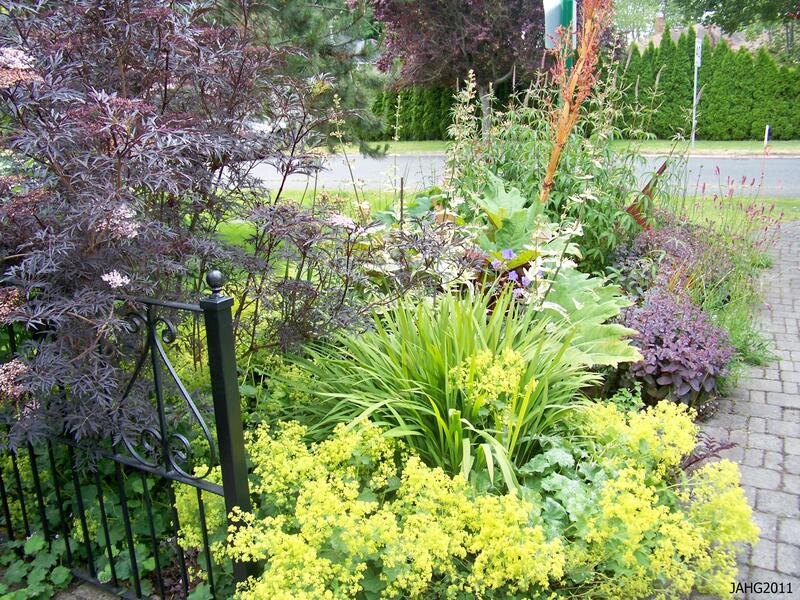 The species form is not commonly seen in gardens as there are more exciting color forms. The less commonly seen species form of Cotinus coggygria is seen here with its lovely green foliage. Smoke Bush are well known for their colorful foliage and there are an increasing number of cultivars to choose from. The oldest color form is probably C.c. ‘Foliis Purpureis'(Rubrifolius) which has rich purple -plum leaves which fade into to greenish tones as the summer progresses. C.c. f. purpureus(‘Atropurpureus’) refers to the coloring of the large panicles of purplish flowers. C.c. ‘Royal Purple’ (Notcutt’s Variety’) has leaves which start maroon red and then matures to black-purple(darkest of all forms) it holds its color well throughout the year and changes into scarlet autumn shades. C.c. ‘Velvet Cloak’ has red violet foliage which is dramatic, its floral display is longer than most. It holds is color well. Cotinus ‘Grace’ leaves emerge in wine-red and has clouds of pink-tinged flowers. A new color yellow range has come out from a chance seedling found at a dutch nursery in 1990, it is C.c. ‘Golden Spirit'(Ancot’) – it does not fade out unless it is under-watered. 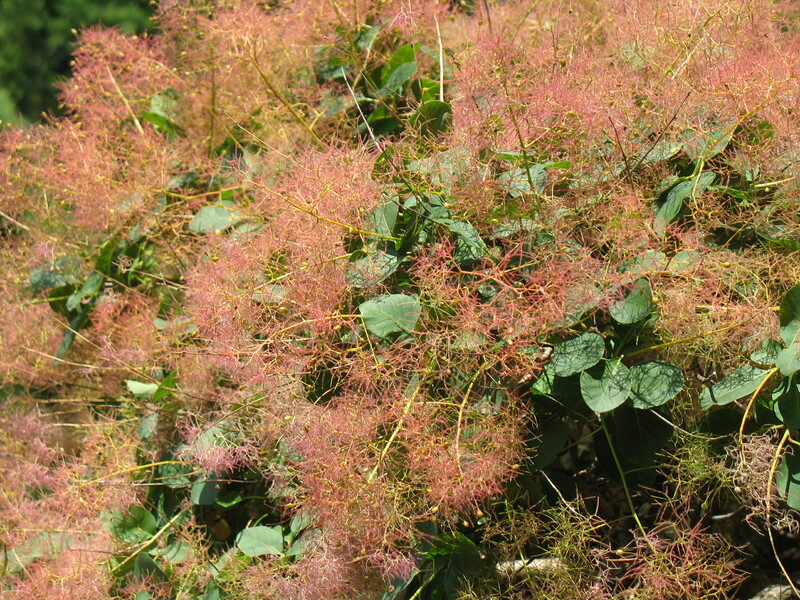 The 'smoke in Smoke Bush or tree(Cotinus species) is from the panicles of tiny flowers and then the whispy seedheads later on. All Cotinus species drier areas often with rocky soil on slopes and hillsides. They have proven to be vary adaptable to many other situations and soils from heavy clay to sandy. They need full sun pr produce the best coloring and floral display. 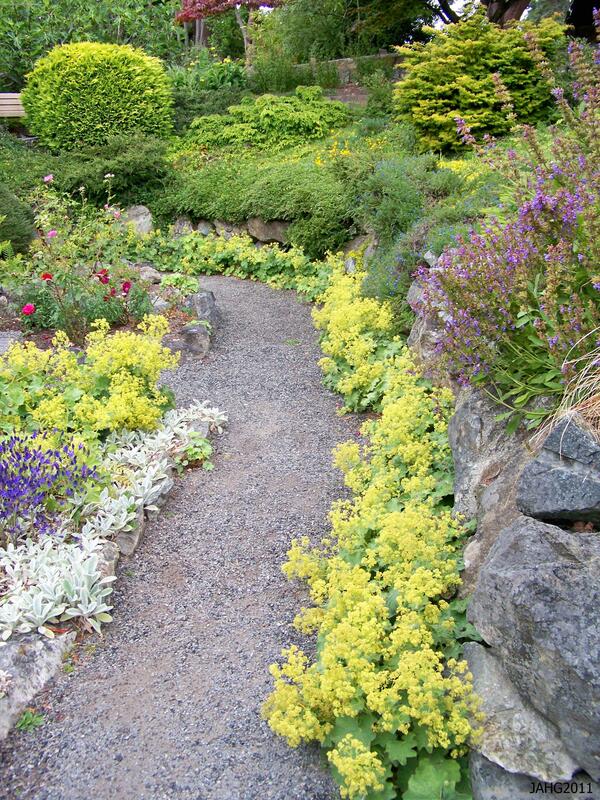 They need adequate watering while becoming established but later are much more drought resistant. They are pest and disease free but sometimes coloring tends to fade out in hotter southern areas, this is where coppicing helps rejuvenate the color. 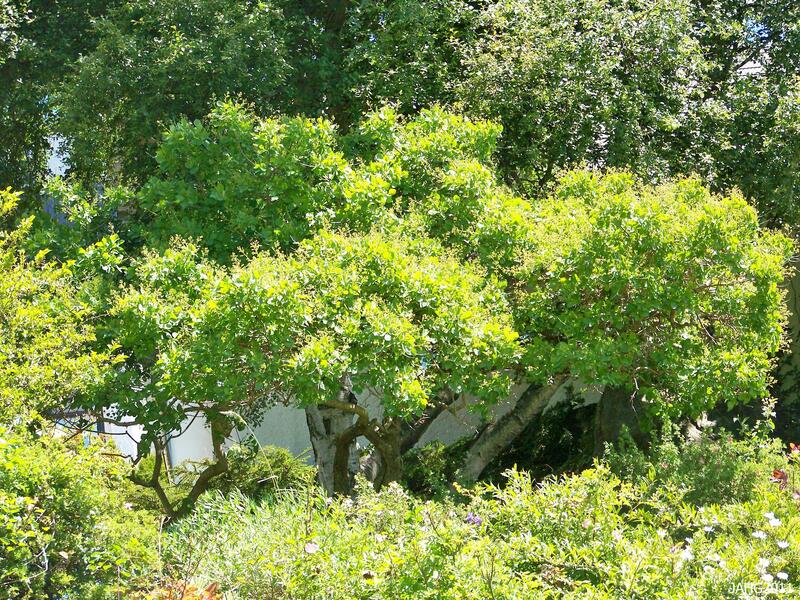 The best coloring is obtained by regularly pruning them hard, use a method such as coppicing to produce wanted effect. 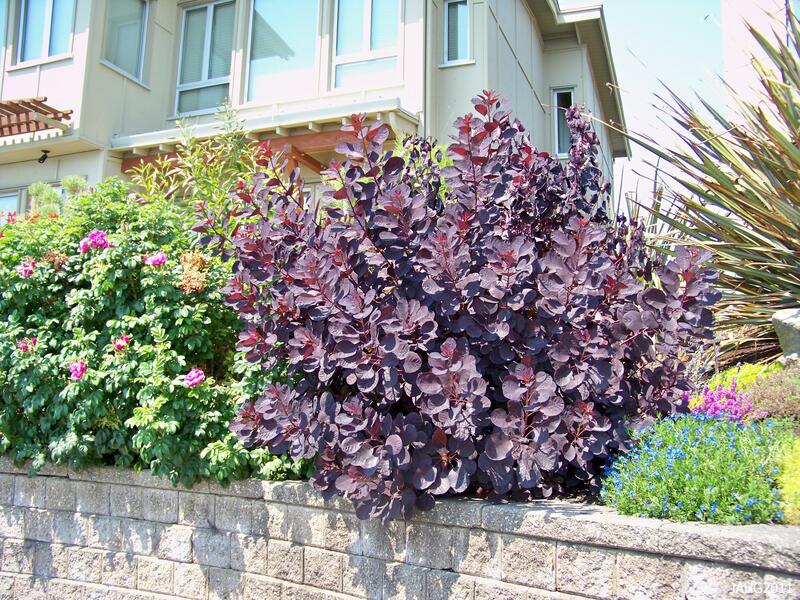 Cotinus 'Royal Purple'(the darkest color) is coppiced to keep its best color and form. All Smoke Bush are rated at zones 5to 9 and take cold temperatures down to -28 c. (-20 f.) In colder climates they generally are cut to the ground which is like the mentioned coppicing. 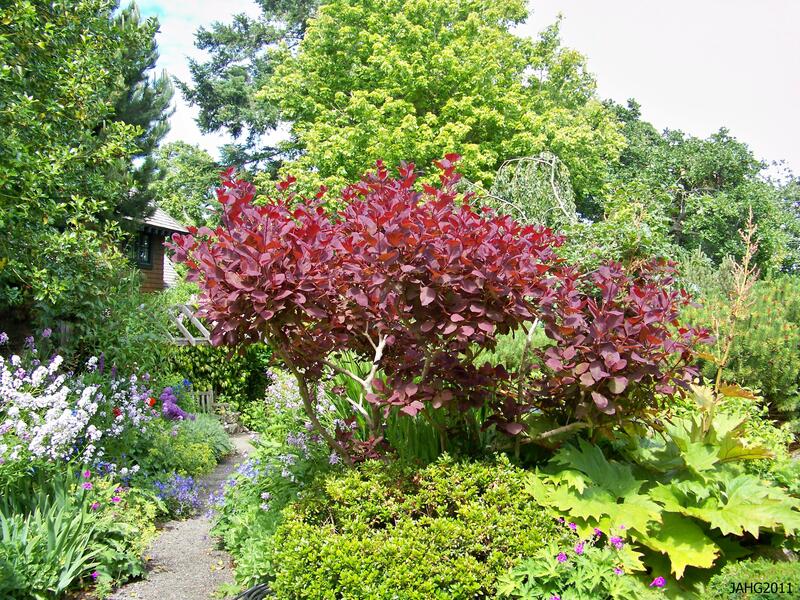 Cotinus can be used as specimens, in shrub borders, as accents, masses, in less watered areas and can pruned into tree forms which are very effective. Cotinus have a lot of appeal in the shape of the leaves and wispy flowers to add to a garden along with strong color. Cotinus 'Golden Spirit'('Ancot') was found as a chance seedling at a Dutch nursery in 1990 and holds its color well in the September garden. My father grew up mainly in the interior where the winters are long and cold and the warm summer months are short and much longed for. I am sure that and his father who loved gardening and nature influenced the way he experienced the world. My father always loved the scent of flowers and would check every new type he came into contact. I often wanted to show him new plant for him to experience and comment on. One plant I was especially happy for him to meet and smell its wonderful scent is Japanese Skimmia(Skimmia japonica). Here in this group of Japanese Skimmia you can see the berried female plants in the front and the males in the back covered with flower buds waiting for the spring. There are 4 species of Skimmia and all are found in Asia; all of the species having attractive berries, aromatic foliage and fragrant flowers. Skimmia japonica was first originally described by Carl Thunberg in ‘Flora Japonica'( published 1784), his record of plants which he collected in Japan in 1775-1776. At that time it was thought the plant was a type of Holly(Ilex). Holly like this Skimmia species has separate male and female plants. Robert Fortune introduce a plant from China which was is a hermaphrodite(male and female parts on the same plant), this plant was later determined to be an important subspecies now known as Skimmia japonica subsp. reevesiana. 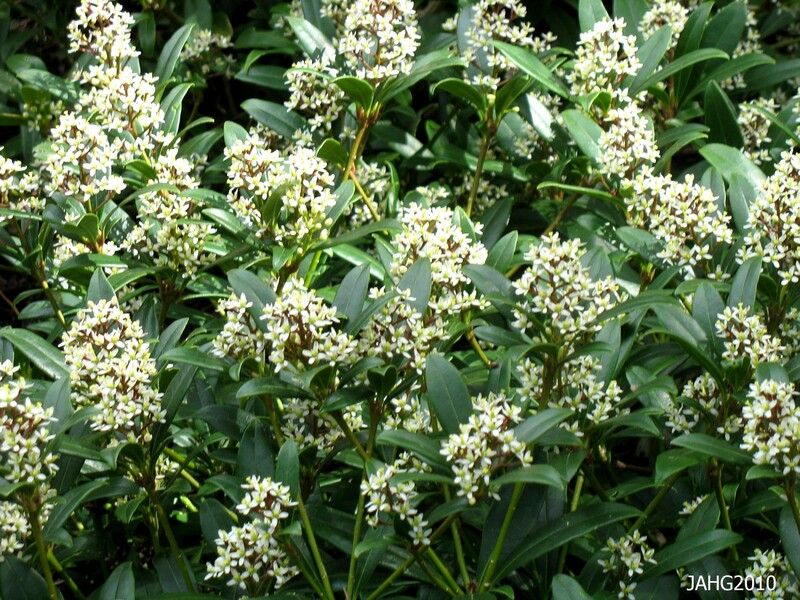 What is now known is that Skimmia japonica is quite variable and is found in a wide range of areas ranging from Taiwan through the Japanese islands into Korea and Sakhalin. With the variability of the species, many new forms have been introduced. This appears to be a female Skimmia japonica plant as there does not appear to be any stamens with pollen present. When Robert Fortune’s plant was introduced to the public by Sunniingdale Nursery in 1849 it was an instant hit and from that time Japanese Skimmia has been valued as a first-rate plant with many desirable qualities. In Japan it has long been used in gardens. The Japanese name for Skimmia japonica is ‘Miyama shikimi’ and Shikimi refers to a completely different species (Illicium anisatum) which is also a highly aromatic plant. 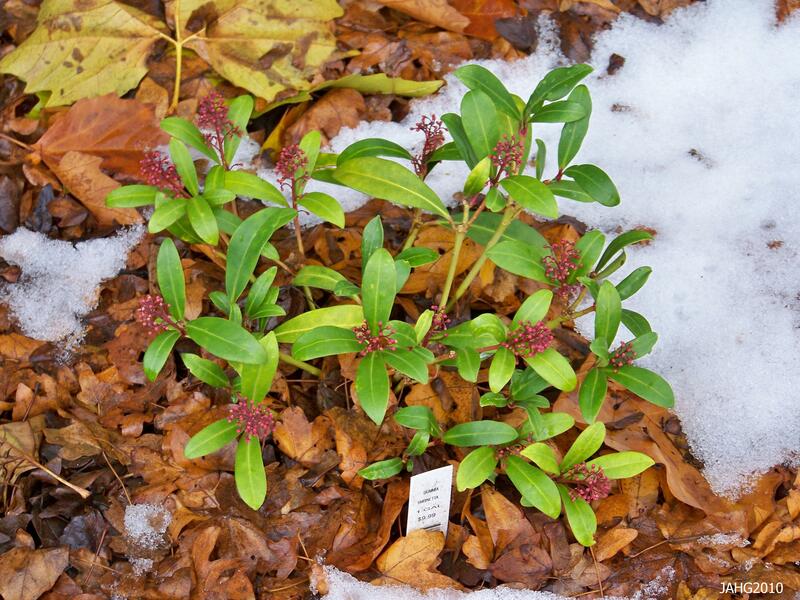 The name Skimmia refers to the latinized Japanese ‘Shikimi’. All of this has also confused people in the past as Illicum or Star Anise is well known spice and is a more tender plant. This male Skimmia japonica clone has distinctly pink tinged blooms. The Skimmia species is a member of the Rutaceae family which we know better for giving us citrus fruit such as oranges, lemons, limes and Grapefruit. Other members are as diverse as the bitter herb Rue(Ruta) and Zanthozylum which gives us Sichuan Pepper and Prickly Ash. Many members of the family are edible and provide us with important fruit, spices and medicinal components. Skimmia is probably is the most important of the strictly ornamental plants. The berries of Skimia japonica are a bright shiny red and are very festive looking at this time of the year. Japanese Skimmias are all around us and we often are not aware of them because their broadleaved evergreen foliage blend in so well with other plants. Skimmia japonica is very popular with better landscape designers and gardeners because the plant is versatile. One often sees them used in shady locations tucked under deciduous trees which will attract our attention most of the year. I see this in Beacon Hill Park under the magnificent Japanese Maples between Goodacre and Fountain Lakes. When the Skimmia blooms the scent flows in the breeze along the path and across the near bridge to delight the many people strolling in the area. Skimmia japonica located under the Japanese Maples near Goodacre Lake. Skimmia japonica and all its forms are easy plants to grow. They like fertile rich soil which is slightly acidic but tolerate clay soils quite well. They like a site which is well-drained but is well watered during the hot summers as they do not like drought conditions. 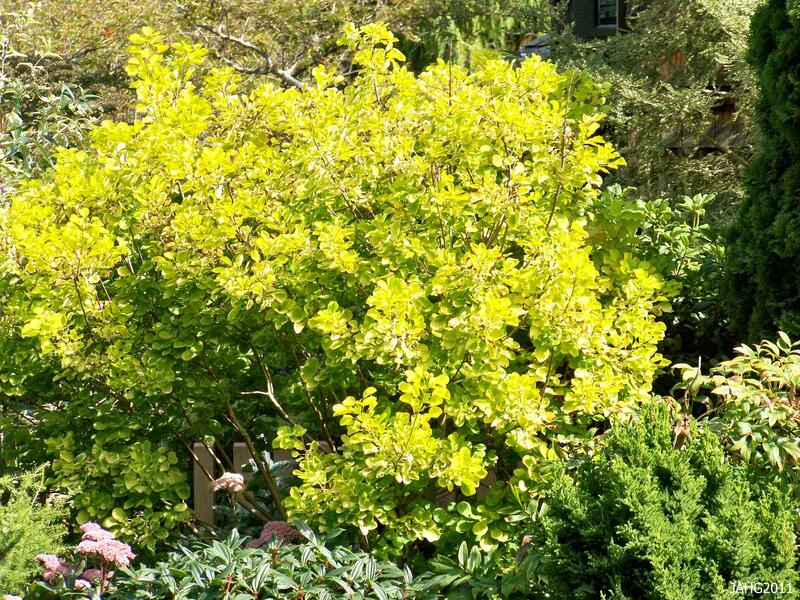 They prefer a site which is dappled or is more on the shady side or their leaves will yellow even in a strong winter sun. As they are evergreen they will do best being in a location which is protected from drying winds especially in the winter season. 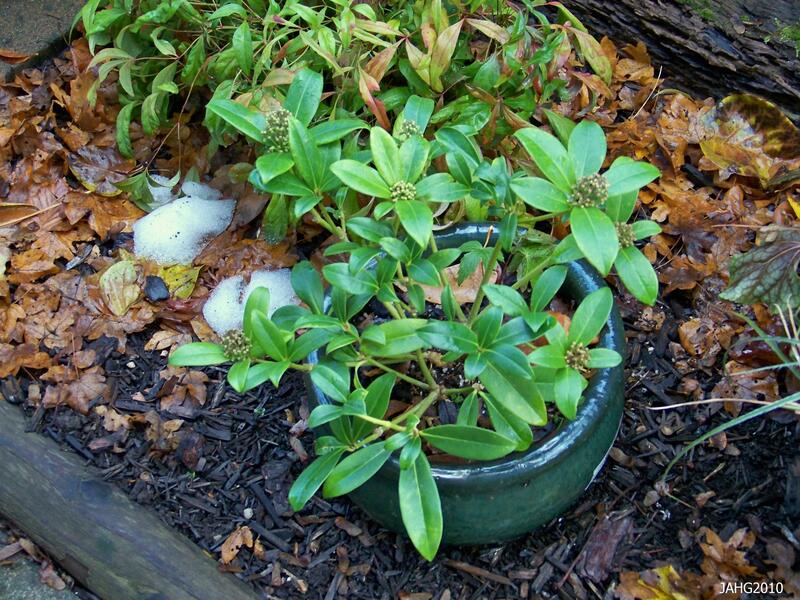 This recently planted Japanese Skimmia has a good mulch of leaves to help it survive the freezing weather and snow. Japanese Skimmias are very slow-growing and dense but over a long time get to be quite large. I have seen plants which are 1.2m(4ft) tall and wide in gardens and it is said that they can grow an astonishing(to me at least) 7m(22 ft) tall. Often now we seen many of the smaller forms such as sbsp. reevesiana which is small enough to fit well into any garden. 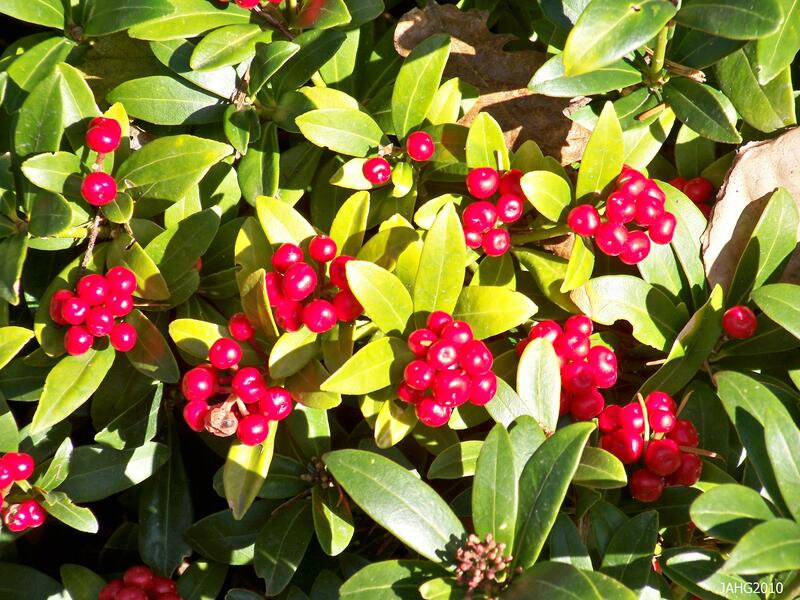 Skimmias are rated as hardy to zone 7 or -12 to-18c (0-10f). Skimmias are easily propagated by seed or softwood cuttings although they are slow to root. 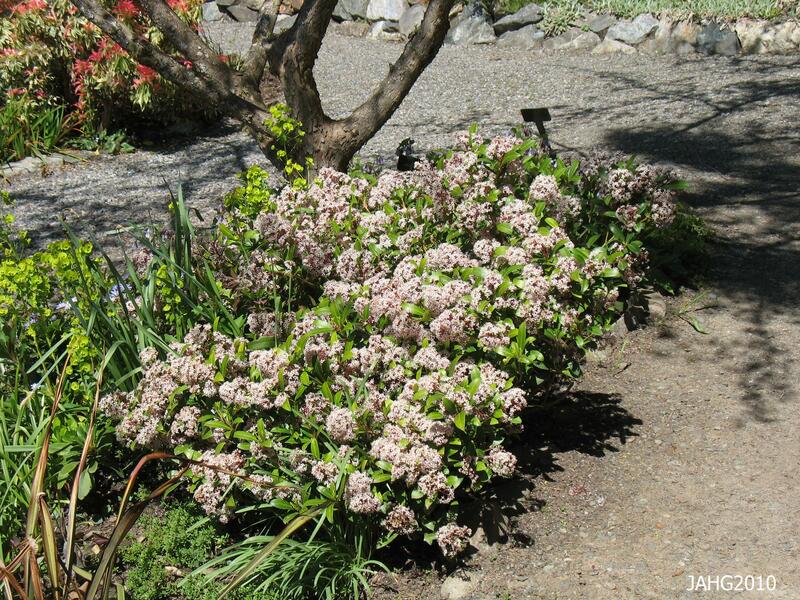 The smaller forms of Japanese Skimmia make excellent container plants which can be moved easily. 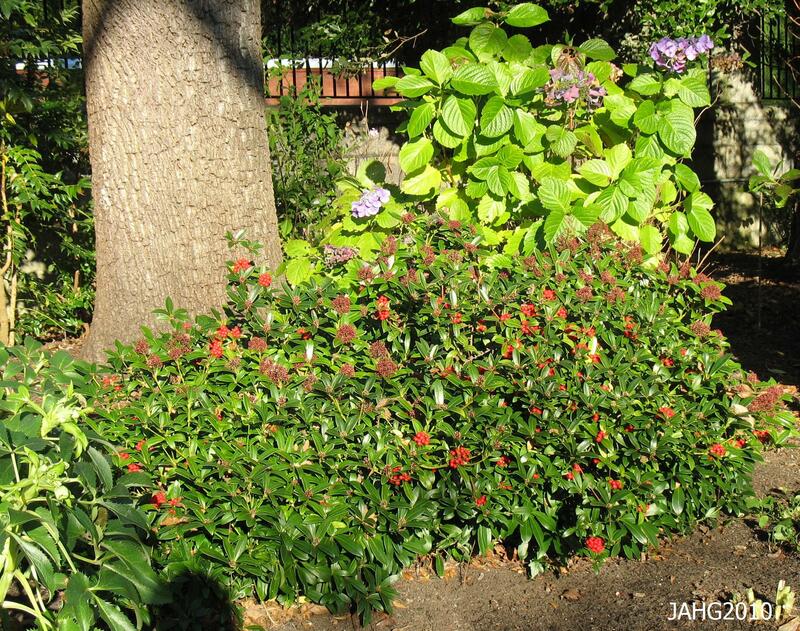 Use Skimmia japonica as an accent, in a winter garden, for fragrance in the spring, along paths where you brush the aromatic foliage. Their colorful berries are bright winter interest and the foliage is not popular with deer or slugs which may visit you. 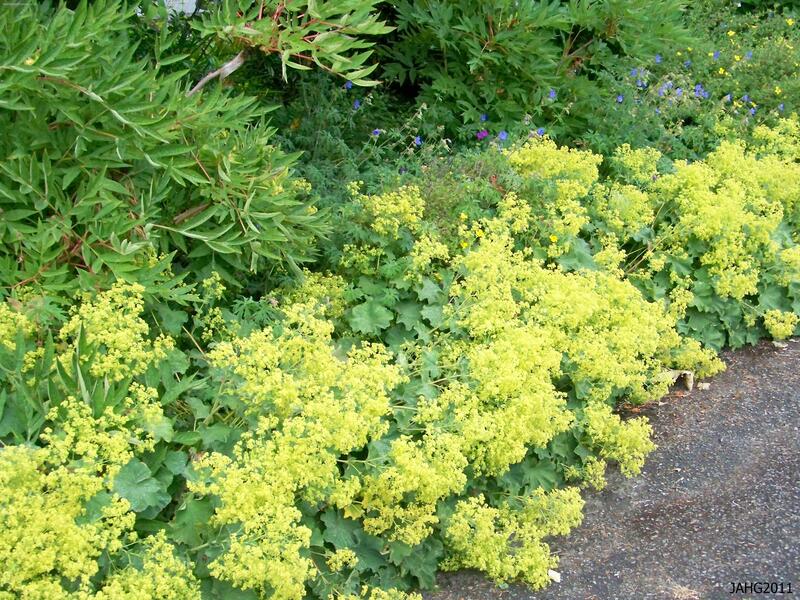 They work well as foundation plants especially when placed near entrances or windows. Skimmias are also popular in a woodland setting or in borders as they are very low maintainance and will need little care over their long life. …Until we meet again soon…I hope….